Important Notice: By making these digital files available for download, we are trusting that you will abide by copyright laws. We kindly ask you not to distribute these files in any way. 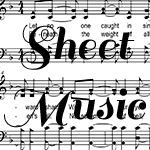 This sheet music is for personal enjoyment only and must stay in your possession. Thank you for understanding and abiding by the law. Copyright © 2019 The Acappella Company. All Rights Reserved.